... & KALIKOBASS II is presently open from September 1-19 ! KALIKOBASS II accommodates up to 8 guests in 4 cabins. 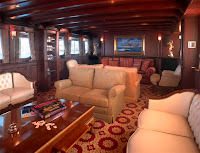 There are four spacious double staterooms each with A/C, TV, VCR, CD player, fridge & en suite head/shower. All four staterooms can convert from two lower twin beds to one king-sized bed. 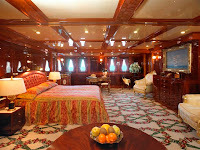 The two forward staterooms have a partition that can be removed to make a large master cabin with centerline king bed. In this configuration KALIKOBASS II can accommodate up to 6 guests. Add the sugar, cinnamon and coconut. Make a well in the center and add butter, milk and eggs. Mix and then fold in the pineapple. 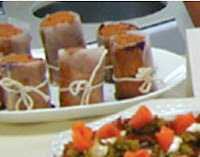 Bake for 25-30 minutes @ 350°F. S/Y QUASART is available for this special annual event at a very special price! 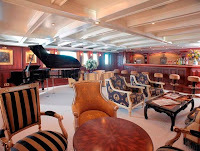 The owner of QUASART is offering a $5000 discount for the New York Yacht Club Cruise, August 1-8, 2009. QUASART can accommodate 12 guests in 6 cabins -- all ensuite, with A/C controls, TV, & CD: an aft master and forward VIP stateroom each have an offset queen bed; two guest cabins have 2 lower twin beds and two have a lower double bed plus lower single bed. Acoustic sound system throughout. 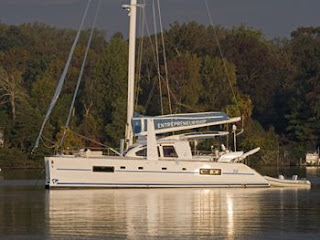 The catamaran ALEXIS, a 38-foot Admiral catamaran, has opened their calendar for October 2009. They will consider charters in the Grenadines or the Virgin Islands. 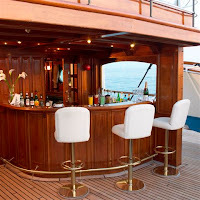 The charter catamaran Alexis, owned and operated by Geoff and Bambi Alexander, accommodates up to 4 guests in the 2 starboard cabins (Queen berths). Christmas charters will be at the normal winter rate, while their New Year charter is $8690. 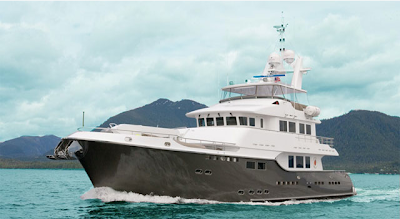 Semper Fi, a 64-foot Horizon motoryacht, is available for charter all summer in the Virgin Islands. 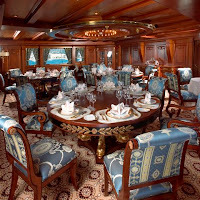 Semper Fi is fully air conditioned and accommodates up to 6 guests in three equivalent Queen cabins, each with flat screen TV, DVD, CD, and private ensuite head/shower. Semper Fi is available for Christmas, through December 26th (their New Year's charter begins on the 27th). We are pleased to announce (drum roll please!) 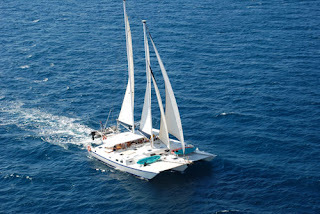 that the popular BVI sail / dive trimaran PROMENADE has opened up one week in their 2010 calendar especially for a cabin cruise charter in the British Virgin Islands from April 19-25, 2010. There are currently 3 cabins available. The cabin rate for this 6-night charter is $3400 for 2 people (not each person). If these dates are not convenient for you, you might consider booking a cabin on the BVI Wreck Week cruise of June 12-19, 2010. Click here for details. The charter yacht ENTREPRENEURSHIP, a 50-foot Catana catamaran, is now in picturesque New England and is ready to welcome you aboard. Based in the Newport Rhode Island area, she will consider charters along New England's coast which is rich in history, culture, and natural beauty. Sail by the summer homes of the Vanderbilts and Rockerfellers. Visit the quaint fishing villages of the Elizabethan Islands. Head out to Martha's Vineyard or perhaps Nantucket. Entrepreneurship is perfect for a weekend getaway if you can't swing a week's vacation. Too late for the Newport Folk Festival & Newport Jazz Festival... E-Ship is already booked for those weeks! Entrepreneurship's starboard hull has a dedicated king-size master cabin built with privacy in mind... perfect for couples celebrating a honeymoon or anniversary. For the second guest cabin, you have your choice of either cabin, also with ensuite head & shower in the port hull. The forward cabin has a double berth, with the aft cabin has twin berths that can be converted to a double. 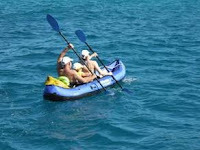 Entrepreneurship will be returning to the Virgin Islands in November for the winter 2009/10 charter season. Entrepreneurship is currently available for both Christmas and New Years! Promenade, a 65-foot trimaran, will be offering this special dive week to charterers on an individual cabin basis, or as a whole-boat private charter... whichever way gets the first booking. In conjunction with The BVI Tourist Board, your week on Promenade will include 6 nights and 7 days onboard our wide stable air conditioned multi-hull with all buffet meals, cocktails and hors d'oeuvres, wine with dinner, all diving, and other water sports including fishing, waterskiing, kayaking. Package also includes a guided narrated tour of Salt Island, your own personal chart to mark your trip around the islands, a complimentary book on the Chikuzen or RMS RHONE, and a souvenir t-shirt! Cost of package is $2000.00 per person, based on double occupancy per cabin. Discounts are available for a group chartering the entire yacht. Our style of diving on Promenade is casual. If you are a photographer, please feel free to go at your own pace. If you want a divemaster to lead you, follow our crew member, if you prefer diving by yourself after a thorough briefing on the site, go ahead. IF you want to get up very early in the morning and jump in the water (as we tend to anchor over dive sites because of night dives this week) feel free to (as long as a crew member knows that you are in the water). This is a sample itinerary ONLY. We have two wrecks, the Parametta and the ROCUS on Anegada Reef, that if the weather conditions allow, we will be going out to dive. We do however, guarantee to hit as many wrecks as we can in the time as we can and to do unlimited diving. Day 1, Saturday 12 June 2010: Board Promenade 12 noon. Promenade will welcome you with a light lunch before sailing over to the wreck of the FEARLESS outside Great Harbor on Peter Island to do our first wreck dive. We will anchor for the evening at Little Harbor on Peter Island. Day 2: We will dive Carrot Rock on the outside of Peter Island after breakfast, one of our favorite dive sites, with pinnacles reaching from 70 feet up to the surface. Lunch will be at White Bay at Peter Island, with time for a beach excursion or snorkeling trip before we dive “Brown Pants” on the outside of Norman Island, or Santa Monica Rock, so named for the Santa Monica that hit the pinnacles here on April 29th, 1783 and subsequently sank at Water Creek on St John. We will anchor for the night at Privateer Bay on Norman Island. Also known as the Caves at Treasure Point and the setting of Robert Louis Stevenson’s Treasure Island. Day 3: After a snorkel before breakfast with all the Glassy Eyed Sweepers in the caves, we will take a short hop over to the Indians, so named as they look like an Indians feathered headdress from a distance, where we will do a dive before sailing up for lunch at Salt Island. After hearing the history of the wreck of the Rhone we will dive the Rhone in the afternoon, and then after dinner SCUBA to watch the turtles sleeping underneath the wreck and the lobsters and crabs wandering around. This is bar none, not only the Best Wreck dive in the Caribbean, but also in the top 5 dives of the world. We will anchor overnight on Salt Island. Day 4: Up and in the water early for a dive before breakfast before anyone else has a chance to disturb the wreck, we will then sail, weather permitting, out to the wreck of the CHIKUZEN, our second most famous wreck. 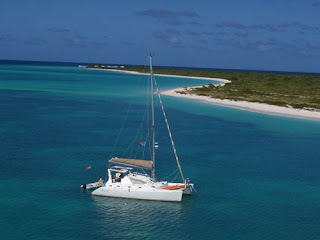 We will dive the Chikuzen before lunch and again, after lunch before taking a leisurely sunset sail into Muskmelon Bay on Guana Island, one of our favorite deserted anchorages. Day 5: After a breakfast of watching the pelicans circling while they feed on the billions of bait fish in this bay, we will go around to the outside to dive Grand Central Station. Grand Central Station is so named for the many fish that converge around here, and it is capped up by a spectacular large cave that goes through the island at about 60 feet. We will then sail over to Cooper Island and dive the wreck of the Beata after lunch. We will stay overnight at Haulover Bay there and fit in another night dive. Day 6: We have two wrecks on our diving agenda today, the Inganess and the Marie L and the Pat, along with spectacular snorkeling and beachcombing before making our way around to Salt anchorage for our guided and narrated tour of the island, which is a very important part of the RMS Rhone’s history! We will then have a wrap up barbecue that evening on Salt Island! Day 7, Saturday 19 June 2010: Sadly, it is time to sail back to Road Town in the morning to disembark and leave paradise, with great memories. $4000.00 based on 2 people sharing a cabin. 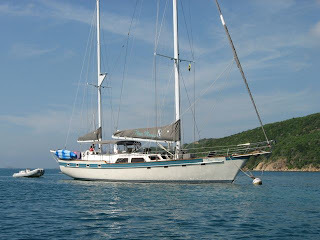 If you are unable to take advantage of BVI Wreck Week (June 12-19, 2010), Promenade is offering a cabin cruise April 19-25, 2010. Click HERE for details. 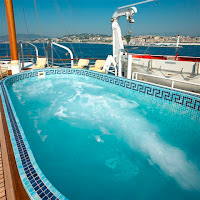 PLUS, they have other weeks available in the season for "normal" private charters (i.e., not cabin bookings). 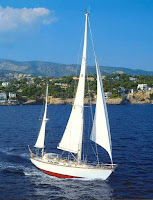 The passenger vessel SS DELPHINE is offering low season rates for July & August 2009. Legend has it that the Yalta Treaty was drawn up here during the Delphine’s stint in the U.S. Navy. If only these walls could talk... with the likes of President Franklin D. Roosevelt, Harry S. Truman, Molatov and Winston Churchill who once enjoyed the hospitality of the Delphine. Launched in 1921 at the Great Lakes Engineering Works in Michigan, S.S. Delphine, was at 257.8ft and 1,342 tons, the largest yacht built in the United States that is still in existence today. 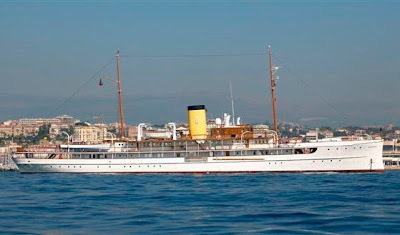 Re-christened in September of 2003, by H.S.H Princess Stephanie of Monaco, S.S. Delphine is one of the most unique and exceptional vessels for charter in the Mediterranean fleet. In 2004 she received the annual showboats award for best refit. This is a beautiful steamship... There are just too many photos to choose from so please check out her first online brochure to get a quick overview of this yacht, and then look at the second brochure for more information (see links at end of post). 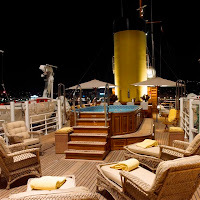 Besides the superb staterooms, there is a swimming pool, fresh or saltwater Jacuzzi, professional hair dressing salon, smoking lounge, music room, bars, sauna, steam room, fully-equipped gym, and more! S.S. DELPHINE has accommodations for up to 26 guests sleeping in 12 cabins, can cruise with up to 30 passengers and by special request, during the day with up to 160 passengers within 5 miles from the shore. She is also available for static charters for up to 250 passengers. SS Delphine is offering the low season rate for any one week charter minimum booked in July and August (€245,000/week, plus all expenses, VAT exempt – instead of €360,000/week). Based in Monaco, she will cruise the Mediterranean this summer with the professional Captain Kai Ketonen, and his 23 crew (including the exceptional French/Mauritian chef Shailandra Dhuromsingh). 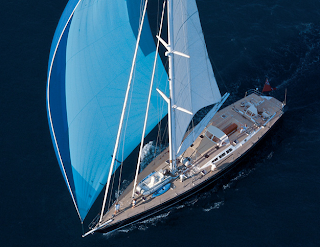 A unique vessel, S.S. Delphine is based in Monaco and will cruise the Mediterranean this summer. 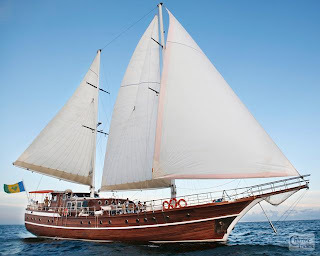 Furthermore, she is offering the low season rate for any one week charter minimum booked in July and August. 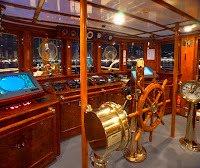 Captain Kai Ketonen and crew are looking forward to welcoming you onboard! CARYALI, Nordhavn's Hull #1 in the 86' Series, launched in 2007, offers luxury accommodations for up to six guest and two children in four staterooms. 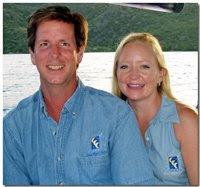 Her professional crew of four offers exceptional service for a luxury charter experience that exceeds expectations. Whatever your itinerary, this spacious and elegant expedition style yacht is built for luxurious and economic, long distance cruising. Whether in the Caribbean or Mediterranean you are guaranteed to travel in style! With a 24-foot beam, CaryAli is more than impressive at first sight, and comparable in comfort, service and amenities to vessels well over 100 feet. Guest Stateroom below decks to starboard: King stateroom (which can convert to twin beds), with ensuite bathroom with a shower. Entertainment center with 19" plasma TV/DVD and Surround Sound. Guest Stateroom below decks to port: King stateroom (can convert to twin beds), with en-suite bathroom with bathtub / shower. Entertainment center with 19" plasma TV/DVD and Surround Sound. Guest Twin Stateroom available for children or staff with ensuite bathroom with shower. Entertainment center with 19" plasma TV/DVD and Surround Sound. 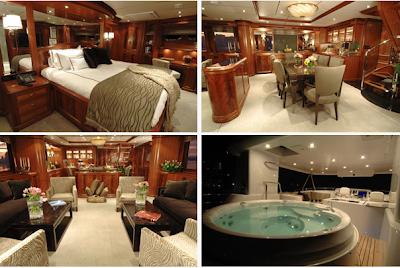 The motor yacht PATRIOT, is offering Day Charters for up to 6 guests or Bed and Breakfast style charters for 2 guests. A unique opportunity to enjoy day excursions to Block Island, Long Island, Martha's Vineyard, Nantucket ... this Little Harbor WhisperJet 38 express cruiser will take you there fast in style & comfort! Up to 6 guests for day excursions or a romantic overnight "Bed and Breakfast" for 2 Forward queen V-berth, head, shower, galley. PATRIOT is fully air conditioned through out. 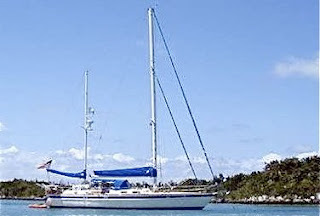 $1,500 for 8-hour day charter for up to 6 guests, plus all expenses (or $2,100 including fuel). So, treat yourself to a quick getaway! Three Moons, their 72/65-foot Irwin charter yacht, has been hauled out in Virgin Gorda for HER summer vacation. "Even after many haul outs over the years, we never get used to the strange sight of our home up in the lift straps traveling slowly down the road in the boat yard! It's a bit like taking the "Big Top" down at the circus which culminates with a big party at the end of the day!" They also gave us an update on what their past crew are up to! "Most of them work for us at least two years. Yes, they move on to other things and new lives as time goes by. Every one of these gals became a part of our family. We've joked many times that we don't have kids; but we really do!" Shauna Kuhn returned stateside to earn her masters degree in Environmental Studies and now works at Stony Brook University as a research technician. She's happily involved in a oyster restoration project in the Hudson River, Manhattan, New Jersey, Jamaica Bay (Queens, NY) and Shelter Island (eastern end of Long Island). The goal of her team's project is to figure out where, if any place, they can restore the over harvested oyster population. We all love Meredith "Mini-Moon" Hester and still see her often in St. Thomas! Mere and her husband Jonny (captain of charter yacht Conundrum) have just announced that they are going to be parents in late December! We are so excited for both of them! Katy Bednar was in St.Thomas last month to visit the "love of her life" and celebrate her birthday. She returned to Boston last fall and is doing well at Boston University studying dentistry. She's already interning; but says they won't let her do the fun stuff yet! Six years of dental school is a long time! Becca Lee will be happily working with her new boyfriend next season aboard a 90' power yacht. We wish them both many great adventures and much happiness together! Three Moons will begin their new season in November 2009. They are booked for New Years, but available through December 26th for a Christmas charter! Have a fun summer Shelly & Randy. See you in November! NEWPORT Music Festivals - Book Now - Still Time! Just wanted to remind you that there's still time to book a boat for the Newport Music Festivals.